This doorway is a disaster but the solid wood door is worth saving. 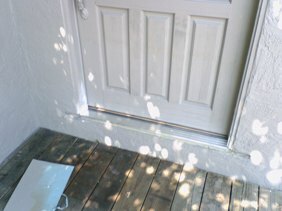 We opted to repair the door jamb where dry rot was present and install a new doorsill. The new doorsill was installed first. 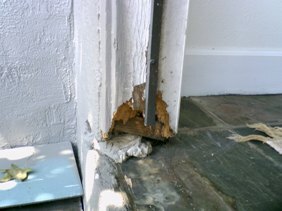 Then, using a fast hardening epoxy wood filler, the gaping hole in the jamb can be repaired and sanded to blend. This job required two trips. I just replaced three such sills on a 1950’s home. Charged $225 each, lots of handcrafting to match up with old work. I am fixing to repair and reinstall threshold where it’s leaking in the downstairs bathroom that is below the door how much would I charge?